See this excellent 7-minute video discussing the origins of Dispensationalism and the idea of a secret rapture, from NT Professor Ben Witherington III. I want to be Left Behind, by James Michael Jones–reblogged below this text and my comments. Yes, some scholars see the “taken” as being “to judgment.” Robert H. Mounce (New International Biblical Commentary), sees this as parallel with the ‘”taken away” by the flood’ (v. 39). Others think it is ‘left for judgment (e.g. NICNT). But the two differing views do not detract from the key point–“The coming of Jesus marks a complete and permanent division” (Leon Morris) “. . . the decisive moment.” “The sayings emphasize the completely unexpected nature of the Man’s coming” (AB). Left Behind will be released in theaters soon. 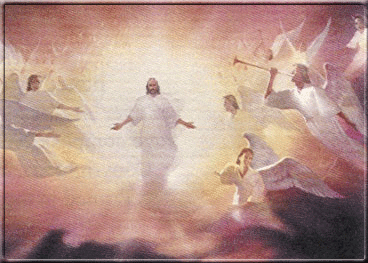 One of the verses used to describe the Rapture is Matthew 24:40. 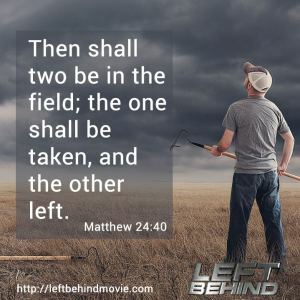 It states: “Then two men will be in the field; one will be taken and one left.” According to supporters of the Left Behind series of books and films, no one wants to be ‘left behind’. Thessalonians is one of the earliest books of the New Testament. (Some think the earliest. F.F. Bruce suggested the possibility that Galations preceded it. But overall, James was probably the first.) Understandably, these new Christians in this new church had questions and misunderstandings that needed answers. It begins in v. 13 with Paul addressing their concern about fellow Christians who have already died. Were these who had died now at some disadvantage? What hope did those who still live have for them when Christ returns? Verse 14 points to Jesus’ death and resurrection, the central theme of Christian hope concerning those who have died. See 1 Corinthians 15 where Paul addresses the question of the resurrection. Christ’s resurrection was the first fruits, and the resurrection of Christians is the final harvest, v.23 “at His coming (parousia)” when “we shall all be changed—in the twinkling of an eye, at the last trumpet” (verse 52). Verse 15 gives the key point of this passage (addressing the concerns of the Thessalonians) that, when Christ returns, the living Christians have no advantage over those who have died. Verse 16 describes, in familiar terms (for us who have the NT), Christ’s return (parousia). This is no secret event. See N.T. Wright speak of this, here. Verse 18 (This is no gnostic revelation of some new doctrine of a secret ‘rapture’.) The whole point of this passage is to encourage each other in the hope given to us regarding death through Christ’s death and resurrection.